It goes without saying that 3D printing technology has become an industrial phenomenon, allowing the common man to make anything from guns to houses. Today, MakerBot is taking things a step further, revealing its first fully automated “3D Photo Booth.” Yes, you can now scan and print your face. MakerBot and ShapeShot teamed up to create the booth, which is able to capture and replicate an individual’s facial features with the click of a button at MakerBot’s newly launched retail outlet in New York. After taking your picture, the 3D Photo Booth will take 5 minutes to process the image and send an email with snapshots of the final bust (shown below). The consumer can then decide whether to order a piece from MakerBot’s Brooklyn manufacturing plant. CEO Bre Pettis described it as a “new way of portraiture”. Tourists and locals alike have visited the New York City store, apparently spending 30 minutes on average tinkering with and purchasing 3D-printed cars, doll houses, watches, and even whole MakerBot Replicators. Bubble gum machines line the wall, filled with MakerBot knick-knacks instead of sweets. MakerBot wants to inspire people to make instead of buy the things they need, and demonstrate that such technology is accessible. 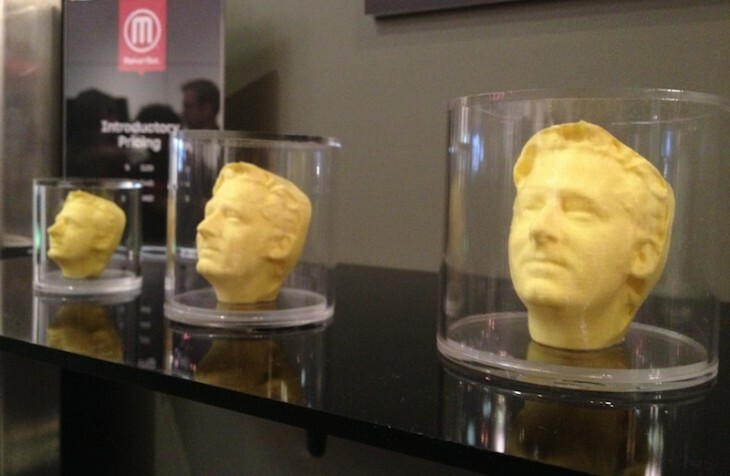 Come January, MakerBot will hold seminars on everything from finishing to design packages. Away from your loved ones this holiday season? Have more parties to attend than physically possible? Not to fret. Give the gift of your pretty face in small, medium, or large in one of four different colors and it will be the center of attention. Personally, I’m looking forward to getting my face served in about six days. We’ll update this post with pictures of it as soon as it arrives. It’s noteworthy that technology of this sort previously existed, but tended to be either inaccurate (like 123D Catch) or highly expensive. No matter what though, we’re excited to see voluntary face scanning and printing become more accessible. Need a refresher on 3D printing? Take a look at a brief infographic here.